Current approaches in bone regeneration combine osteoconductive scaffolds with bioactive cytokines like BMP or VEGF. The idea of our in-vitro trial was to apply VEGF165 in gradient concentrations to an equine collagen carrier and to study pharmacological and morphological characteristics of the complex in a circulation model. 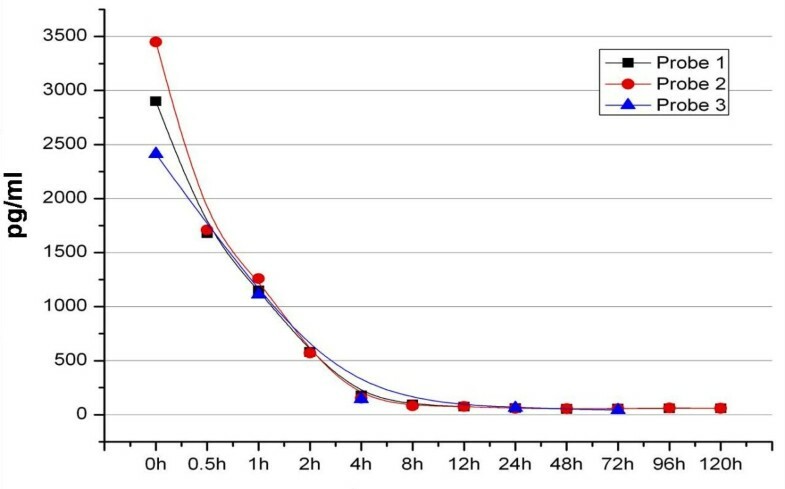 Release kinetics of VEGF165 complexed in different quantities in a collagen matrix were determined in a circulation model by quantifying protein concentration with ELISA over a period of 5 days. The structural changes of the collagen matrix were assessed with light microscopy, native scanning electron microscopy (SEM) as well as with immuno-gold-labelling technique in scanning and transmission electron microscopy (TEM). We established a biological half-life for VEGF165 of 90 minutes. In a half-logarithmic presentation the VEGF165 release showed a linear declining gradient; the release kinetics were not depending on VEGF165 concentrations. 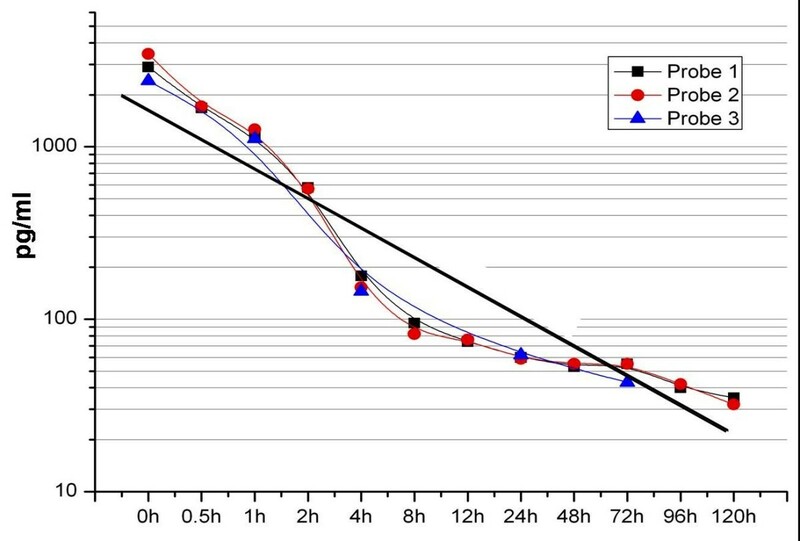 After 12 hours VEGF release reached a plateau, after 48 hours VEGF165 was no longer detectable in the complexes charged with lower doses, but still measurable in the 80 μg sample. At the beginning of the study a smear layer was visible on the surface of the complex. After the wash out of the protein in the first days the natural structure of the collagen appeared and did not change over the test period. By defining the pharmacological and morphological profile of a cytokine collagen complex in a circulation model our data paves the way for further in-vivo studies where additional biological side effects will have to be considered. VEGF165 linked to collagen fibrils shows its improved stability in direct electron microscopic imaging as well as in prolonged release from the matrix. Our in-vitro trial substantiates the position of cytokine collagen complexes as innovative and effective treatment tools in regenerative medicine and and may initiate further clinical research. The human skeleton is subject to permanent remodelling processes: 5% of the human skeleton is rebuilt per year. This remodelling is an integral part also of the mechanism of bone healing and regeneration of bony defaults. In the process of bone healing and regeneration, biochemical procedures follow a well-defined temporal and territorial pattern. Resting chondrocytes start to proliferate, differentiate into hypertrophic chondrocytes, and synthesise collagen and extracellular matrix. Then blood vessels invade; osteogenesis takes place in the vicinity of neo-vessels that mediate the delivery of osteoprogenitors, secrete mitogen for osteoblasts, and transport nutrients and oxygen. The cartilage matrix is degraded and replaced with the typical trabecular bone matrix produced by osteoblasts. Blood vessels provide a conduit for the recruitment of cells involved in cartilage resorption and bone deposition and are therefore a crucial condition for any regeneration [1, 2]. The process is operated by a variety of cytokines as bone morphogenetic proteins (BMPs) or vascular endothelial growth factor (VEGF) [3, 4]. There are two basic options to support bone formation: to enhance the remodelling processes by optimizing the vascularization via application of potent angiogenetic cytokines as VEGF or to implant a scaffold to provide a matrix that induces bone regeneration [5, 6]. VEGF is an important cytokine in the process of endochondral bone development and mediating bone vascularisation for normal differentiation of chondrocytes and osteoblasts. An increase in VEGF is an indication of increased vascular permeability and microvascular activity, including angiogenic growth of new blood vessels [7–9]. VEGF is a homodimer glycoprotein, its family includes 6 related proteins; VEGF165 is most common and biologically active . It is released by many cell populations as fibroblasts, monocytes, macrophages or lymphocytes . The corresponding receptors belong to the tyrosine kinase family. VEGF165 induces angiogenesis on different levels: it acts as mitogen especially on endothelial cells, raises the vessel permeability and dilatation by releasing NO and has chemotactic impact on other growth promoting cell populations . The most potent stimulus for VEGF165 synthesis is lack of oxygen. Under hypoxia an increase in VEGF165 mRNA was shown and, in addition, the RNA's half-life was extended. This effect is translated by the hypoxia sensitive transcription factor HIF1. The instantaneous angiogenetic effect of VEGF165 is the increase in vessel permeability and mitogenic stimulation of endothelial cells. According to its potential VEGF165 is also involved in pathophysiological processes like tumour growth; mainly in hypoxic tumour regions raised VEGF165 levels were scored [13, 14]. Disadvantageous for a routine use are a difficult handling of the liquid application form, its short half-life and susceptibility to light and temperature. Some of the common methods used to repair bony skeletal defects are autografts, allografts, or synthetic implant materials. Yet, imperfections persist in these methods, such as limited harvesting, the possibility of disease transmission, poor biocompatibility, and the risk of prosthetic implantation failure. Therefore, alternative strategies, such as tissue engineering approaches, are needed to improve the treatment and quality of life of all patients. Biocompatibility, namely of the surface. Widely-used materials are hydroxylapatite and tricalcium phosphate as synthetic inorganic bone graft substitutes. They come with good biocompatibility and osteoconductivity. Yet, they are brittle and not resilient in functionally stressed areas [15–17]. The advantage of collagen as a natural substitute is the fact that collagen is the main constituent of organic bone matrix. Fitted in bony defaults it is not degraded by but incorporated into the regenerating tissue. It accelerates the healing process and reduces the side effects of decomposition products [18, 19]. In innovative approaches the osteoconductive collagenous scaffold is combined with the osteoinductive impact of cytokines like BMP or VEGF165. The objectives of our study were to apply VEGF165 in gradient concentrations to an equine collagen carrier and to study the complex in a circulation model. The VEGF165 release kinetics should be quantified and the morphological degradation of the collagen-cytokine complex should be visualized. Collagen I was purchased (Resorba, Nuernberg, Germany) and liquefied. Human recombinant VEGF165 (R&D Systems, Wiesbaden, Germany) was added in different concentrations. The complexes were formed in hemispheres and drugged with aldehyde to avoid the cross-linking of collagen fibrils. The total quantity of collagen was 5.6 mg/cm3 per application, VEGF165 was added in 0.8 μg, 10 μg or 80 μg quantities. We used a digitally controlled peristaltic pump that delivered the medium with a mean flow rate of 27 ml per minute (Cole Parmer Masterlex Console Drive Pump). As aqueous solution a 0.2 mol PBS buffer was utilized in a total quantity of 80 ml. Circulation was simulated under constant conditions of 20°C and pH 7.2. On day one we took samples after 30 min, 1, 2, 4, 8, 12 and 24 hours. The next specimens were taken after day 2, 3, 4 and 5. VEGF165-free collagen complexes served as negative controls and were analysed identically. VEGF165 concentrations were assessed by performing a solid-phase VEGF165 Immunoassay (VEGF165 Quantikine, DVE00, R&D Systems GmbH, Wiesbaden-Nordenstadt, Germany). The ELISA was performed according to the manufacturer's protocol; its sensitivity was described as < 9 pg/ml. The concentration of VEGF165 was expressed as pg/ml. VEGF165 was quantified by using a standard curve made by human VEGF165 ranging from 31.2 pg/ml to 2000 pg/ml. The chromogenic reaction was read at 415 nm (Molecular Devices). Collagen samples were processed according to a standard protocol. In short, they were fixed, dehydrated in increasing gradients of ethanol and embedded in paraffin. Thin sections were sliced, stained according to an azan standard procedure and fixed in methacrylate. The sections were evaluated with a light microscope (Zeiss Axioscop, Jena, Germany). Samples were fixed in 3% glutaraldehyde in 0.1 mol phosphate buffered saline and then washed in the buffer (0.1 mol PBS). After rinsing, the samples were dehydrated in a graded ethanol series and dried with a critical point drying. All dried samples were mounted on aluminium stubs and sputter coated with coal to a coating thickness of 8 nm. For immunohistochemical SEM analysis the sections were fixed in 4% paraformaldehyde solution, rinsed with 0.1 mol PBS buffer and incubated with primary VEGF165-specific antibodies at room temperature for 1 hour. Afterwards, the secondary immunogold-labelled antibody was incubated at room temperature for 1 hour. Between incubation steps phosphate buffered saline rinses were performed. All antibodies were diluted according to the manufacturers' instructions. The gold particles as spheres of a 10 nm diameter were easily detectable in scanning electron microscopy. 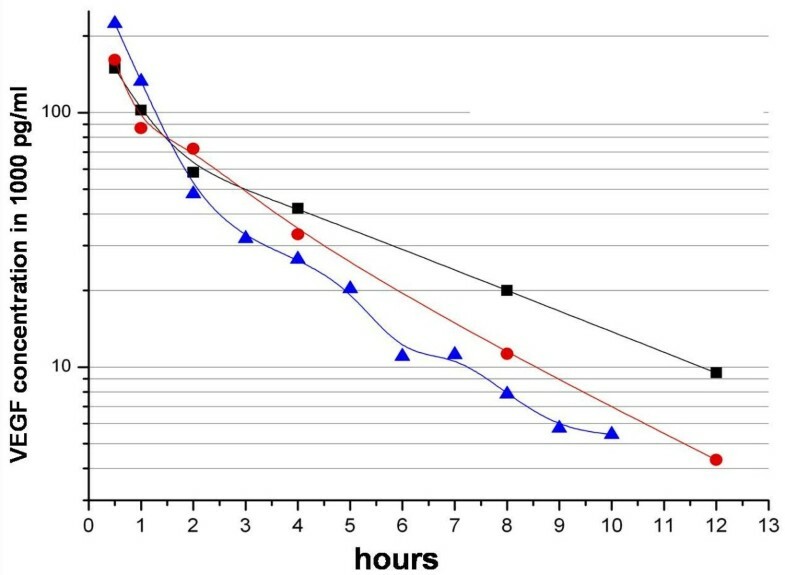 For TEM analysis the collagen samples were fixed in 3% glutaraldehyde for 24 hours, rinsed in 0.1 mol phosphate buffered saline and incubated in osmium acid for 1 hour. Afterwards, the samples were dehydrated in a graded ethanol series, embedded in araldite and sliced thin sections (1 μm). 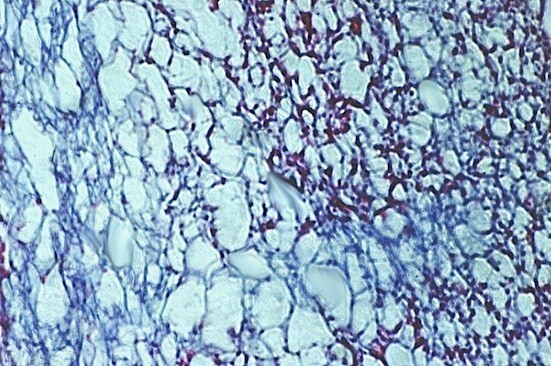 The slices were stained with tolouidin blue following a standard procedure. Representative areas were cut in ultra-thin slices of 70 nm, placed on copper nets and analysed in transmission electron microscopy. Immunohistochemical staining was performed as described before; the gold spheres in TEM presented as dark areas. To determine biological half-life of VEGF165 its dissolution in aqueous solution at room temperature was analysed. VEGF165 collagen complexes charged with 10 μg of VEGF165 were probed over 12 hours. Our results provide a half-life of free VEGF165 of 90 minutes (Fig. 1). In a half-logarithmic presentation the observed VEGF165 concentration showed a characteristic linear decline over time. The gradients of the three VEGF165 doses were parallel and independent of VEGF165 concentration. VEGF165 release reached a plateau after 12 hours and was no longer detectable in the applications of 0.8 μg and 10 μg after 48 hours, whereas the complex charged with 80 μg of VEGF165 still showed measurable cytokine release after over 50 hours. Saturation effects of the buffer medium were not observed (Fig. 2). The efficiency describes the quotient of VEGF165 values scored in our test setting and initially applied VEGF165. Only 10% of initially applied 0.8 μg were finally detected in the present study. Ninety per cent were lost during production, transport or storage. Of the applied 10 μg and 80 μg, 96% respectively 97% were lost (Fig. 3). In light microscopy the VEGF165 collagen complex appears homogenously, presents a reticular structure and shows no signs of structural defaults caused by fixation or coupling with VEGF165. Only in the periphery single agglutinated fibres are detected; these are artefacts caused by the production process (Fig. 4). Collagen matrix, azan staining (100×): representative central area of pure collagen matrix. In scanning electron microscopy the VEGF165 collagen complexes feature more agglutinated parts, even in central areas, in contrast to the collagen matrix without cytokine (Fig. 5a and 5b). 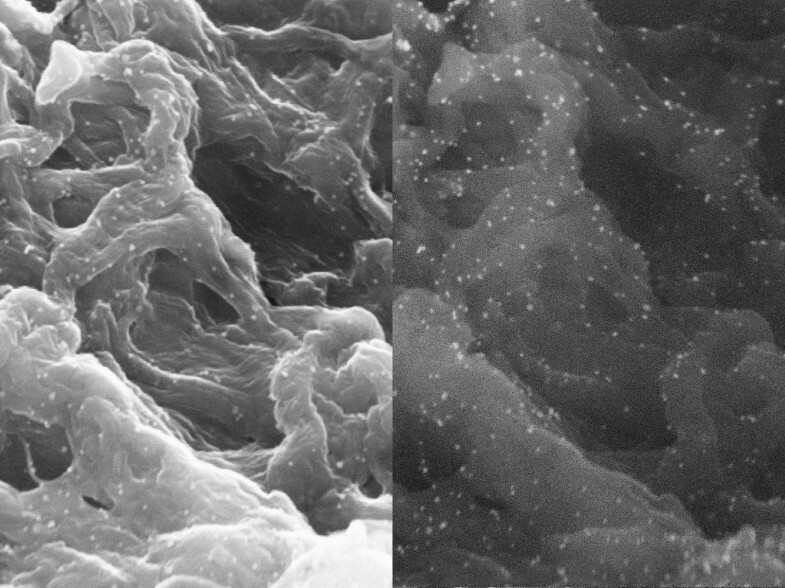 Collagen matrix with (a) and without (b) VEGF, SEM (100×); the smear layer coffering the surface of the collagen matrix can be seen on the left picture. During the five days of degradation process the ultra structure of the VEGF165 collagen complexes changes considerably. On day 0, the collagen matrix is coated by a VEGF165 layer that varnishes the single collagen fibrils. After 3 days of simulated circulation the collagen fibres are clearly detectable; this effect is more obvious on day five. The collagen matrix appears porose and knotty (Fig. 6a and 6b). VEGF 165 -collagen complex on day 3 (a) and day 5 (b), SEM (20000×). With immuno-gold-labelling the VEGF165 molecules are visible. A homogenous distribution of VEGF165 in the collagen scaffold can be proved (Fig. 7). 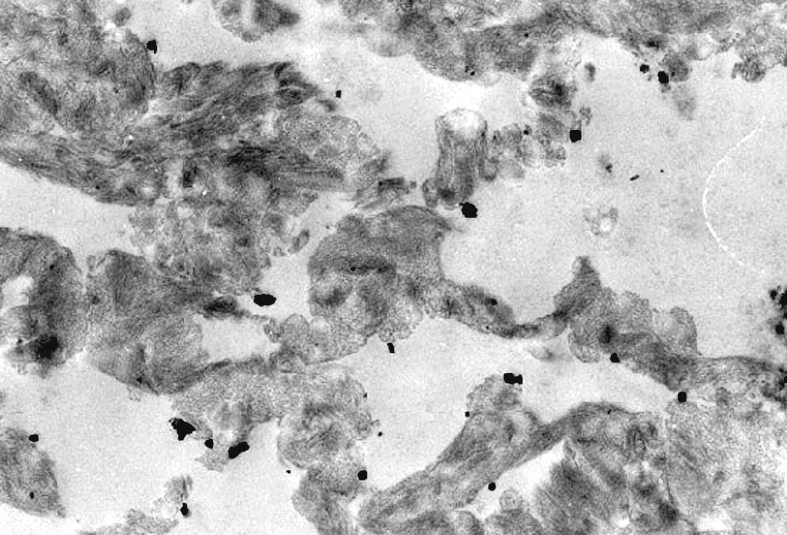 VEGF 165 -collagen complex, 10 μg, TEM, (5000×). In transmission electron microscopy the gold particles present themselves as black round structures (Fig. 8). Single VEGF antibody complexes can be precisely assigned to their corresponding collagen fibril. Due to the close vicinity between fibre and VEGF an adhesion must be assumed that overcomes the preliminary chemical procedure for TEM (Fig. 9). 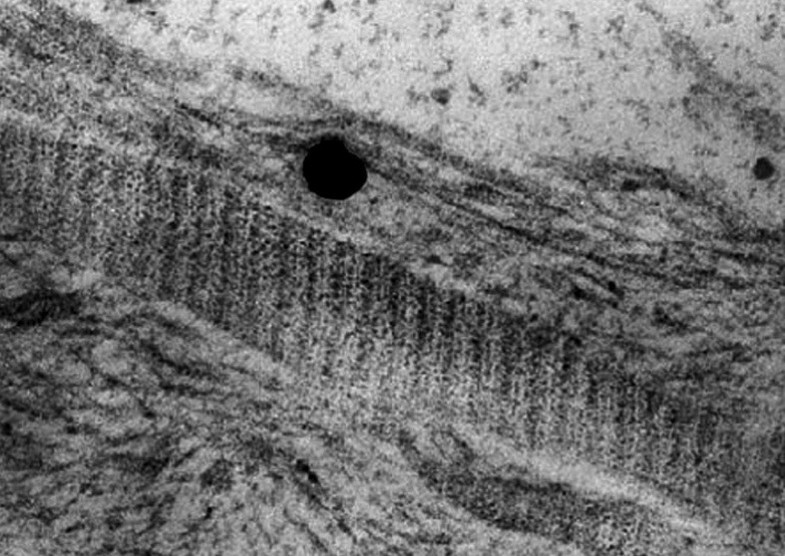 VEGF 165 -collagen complex, 10 μg, TEM (3400×). VEGF 165 -collagen complex, 10 μg, TEM, (21500×); a VEGF-antibody complex in relation to its collagen fibre. To restore form and function to an existing bony defect, vascularisation is the key to success. Clinical experience shows that avascular bony structures namely in chronically infected bones tend to atrophy and fracture . Circulation and angiogenesis are responsible for a restored perfusion of impaired bone areas. Bone cells on the other hand release growth factors to stimulate angiogenesis. Osteo- and angiogenesis are clearly linked in a strong co-dependent relation. The high susceptibility and the low applicable doses of cytokines make high demands: next to good biocompatibility, an easy application mode is critical for the successful use of biomaterials for regenerative medicine strategies [21, 22]. VEGF165 has been exposed as the central angiogenetic protein in the process of bone regeneration; many in-vitro studies underlined its potency to stimulate osteogenesis physiologically via induction of neo-vascularisation . Xenogenic collagen is a well established drug carrier in daily clinical use. As freeze-dried sponge it comes with excellent biocompatibility and is hence the ideal carrier for cytokine application. In the present study the combination of a xenogenic collagen carrier and recombinant human VEGF165 is analysed pharmacologically and morphologically. This kind of research is crucial for forthcoming in-vivo studies where biological factors will overlie and falsify the therapeutical effects of the VEGF165 collagen complex. To be able to interpret these results properly drug release kinetics has to be established before. In cell cultures the VEGF165 specific half-maximum growth stimulation has been determined. The effect of applied cytokines is supposed to range above this score . Our data accounts for VEGF165 release from the collagen over 48 hours; considering the 90 minutes half-life of free VEGF165 it is a surprising result. Obviously, a stabilisation of VEGF165 can be achieved by connecting the cytokine with collagen fibrils. The trial at hand provides only indirect evidence for this assumption but is observed in the whole test series. During the first 50 hours an elevated release rate was observed as described in the literature before. The VEGF165 release is divided in two phases: first, the quick elusion of VEGF165 and diffusion into the buffer medium, and second, the slow sustained disposal when the VEGF165 molecules are dissolved from the degrading collagen fibrils in the deeper areas of the matrix. This pharmacological behaviour corresponds with our morphological findings in REM: hydrolytic erosion reveals the single collagen fibrils and facilitates VEGF165 release. The fraction of released VEGF165 varies in our data from 3% to 10%. Despite ideal test condition the main section of VEGF165 is lost during production, transport and storage. The decreasing efficacy of the higher concentrated VEGF165 carriers argues for a saturation effect, higher doses of VEGF165 in the collagen scaffold do not lead to higher VEGF165 release . To sum up: The biphasic release kinetic allows a hyperphysiological stimulation caused by the applied VEGF165 over 50 hours. It is more efficient than free VEGF165. Higher doses of VEGF165 do not lead to better effects for there is no proportional connection between the dose in the collagen carrier and the emitted total quantity. The interfacing of VEGF165 to a collagen scaffold is not the only way of cytokine application: its transport in micro spheres was described; cytokine mRNA was coupled with a viral vector and cytokine plasmid DNA was directly transferred into the tissue [25–27]. The restitution of bony defaults with a technique that provides biologic functionality, easy mechanical handling and reliable outcome is a significant challenge in maxillofacial surgery. Our idea was to combine an osteoconductive scaffold with osteoinductive proteins and hence to stimulate and support natural healing and regenerating processes. Our in-vitro trial substantiates the position of cytokine collagen complexes as innovative and effective treatment tools in regenerative medicine and paves the way for further clinical research. CF established the circulation model. JK carried out the immunoassays. SJ and KW participated in the design of the study and performed the statistical analysis. UJ, JK and CF conceived of the study, and participated in its design and coordination and helped to draft the manuscript. CF and UJ were involved in revising the article.